I noticed that my screens were lacking stocks making new highs (especially on above average volume) and stocks making moves on above average volume across the board. The general market indices were higher but the leading stocks (the few we have left) were not supporting the moves. Overall, the NASDAQ and DOW are trading below their respective 200-day moving averages and are still trending downward on the weekly charts with resistance at the long term moving average. I was able to pinpoint a few interesting candidates tonight with VISN as my highlighted stock, a stock that has made multiple blog posts since May. 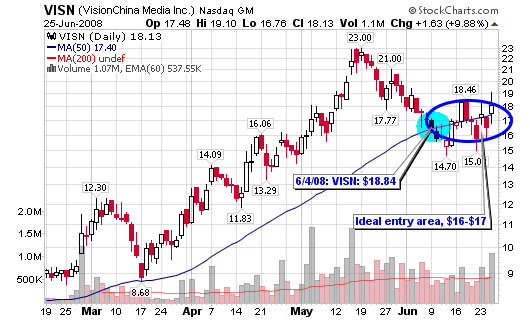 Visionchina Media (VISN), 18.13, a stock I have been starting to profile in multiple blog posts over the past month as it seems to be getting support at the 50-day moving average. It was up almosy 10% today on volume 79% larger than average. It did slide to close the day but looks to be trading in an opportunity area. $15 to $18 is an area to grab shares. Employers Holdings (EIG), 20.39, the stock was up 2.21% on volume 43% larger than the average as it is now trading above the 200-d moving average. Up more than 30% since February. Polypore International (PPO), 26.42, up more than 10% today on volume 38% larger than the average as the stock looks to make a new all-time high. It has more than doubled since the fall-out after the IPO debut last summer. Buys along the 50-d m.a. are ideal. Solera Holdings (SLH), 27.85, up more than 5% today on volume slightly larger than the average as it continues to trend higher (ever so slowly). Stanley (SXE), 33.20, an interesting stock that seems to be building a cup shaped base over the past seven months with some support at the 200-d m.a. 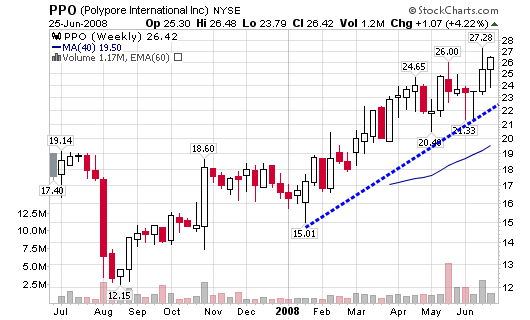 Have some trouble with studder-steps in recent weeks but overall, the chart catches my eye on a weekly view. Some solid and some not-so-solid stocks made the screens tonight (technically speaking) but the main theme of Tuesday seemed to be the resistance near new high territory. My two examples, (CSIQ) and (PPO), were both higher on strong volume but they couldn’t close in new high territory or the top end of their daily ranges. This information tells me that the market is currently facing some resistance or profit taking near new high levels. However, these same stocks facing some resistance now may be ready to take-off once the weak holders are shaken out of their positions. Ideally, that is exactly the type of trade I am looking to enter as I love stocks making new highs with no resistance in sight. CSIQ and PPO made four screens and TITN made three. 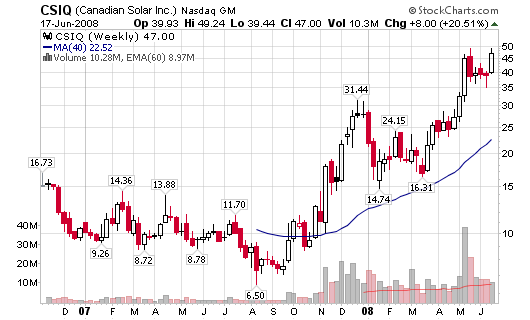 Canadian Solar (CSIQ), 47.00, was up 10.69% today for a two day total of 20.51% on above average volume. Volume was 171% larger than the average on Tuesday and is already above average for the week. The stock is now within 3% of a new all-time high. I do have a major problem with the intraday action which had the stock close in the lower end of the daily range (lower half of the daily candlestick). This type of action suggests some selling pressure near $48 or the buyers from last month looking to break even. A move to new highs later this week is bullish. Polypore International (PPO), 25.38, reached a new all-time high intraday with a 4.49% on volume 187% larger than the 50-day average. As the case with CSIQ, the stock didn’t close at the top of its range which concerns me slightly. Overall, the young stock looks solid as it is trending higher with a new double top breakout on the point and figure chart. 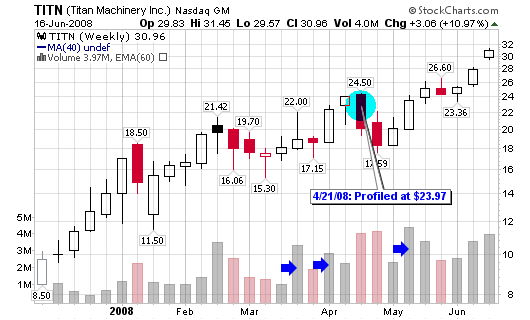 Relative strength is rising as the company lives in an interesting industry group. Today’s screens give us an interesting mix of stocks that were higher on above average volume. I was specifically looking for stocks that were up at least 1% and had volume of at least 50% larger than the average. Several names, such as AAP, ABFS, ACM, EEP, ERES, FDS, GDI, IPHS, NDSN, OMI, PQ, TEVA, TITN, TOT and VIT, showed up on multiple screens. I will admit that not every one of these stocks look appealing after viewing the charts. TITN, Titan Machinery (made three screens) was up almost 11% on volume 509% larger than the average closing at a new all-time high. 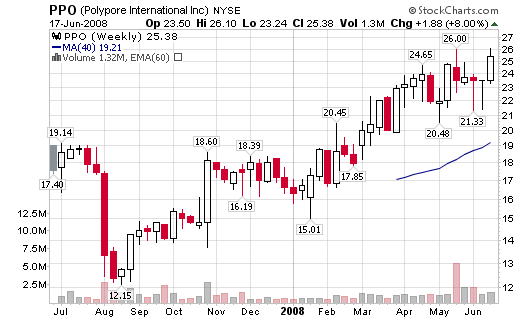 The stock is now up 30% since the original analysis on April 21, 2008 at $23.97 (the ideal trade setup was noted at $21.00 which the stock did drop down to). A buy on a move back above $21 would give you a current gain of 47%. 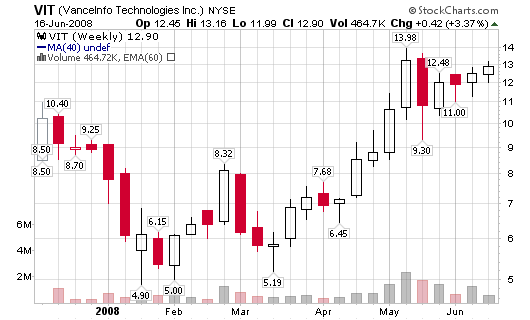 Vanceinfo Technologies (VIT) is a stock that I noticed for the first time today as it was up 3.37% on volume 122% larger than average. VIT made the IPO screen and interesting stocks within 15% of a new high screen. The Chinese stock interests me as it has more than doubled in price over the past three months and is now flirting with a new all-time high. This is exactly how I dissect my screens each night – I look for stocks that are up more than 1% with volume at least 50% larger than the average. Stocks making multiple screens are viewed first but every chart is analyzed.